[extra:Extra]Read “Every Tree Doomed,” a story about the master plan that Van Valkenburgh developed for the replanting of Harvard Yard, from the July-August 1994 issue. With his graying red hair going every which way and his designer black clothes rumpled, Michael Van Valkenburgh, 61, looks like a contradiction: an absent-minded hipster professor. A professor and designer he is—the Eliot professor in practice of landscape architecture at Harvard’s Graduate School of Design (GSD), and probably the most celebrated landscape architect in America. But a hipster he isn’t and wouldn’t want to be. He is much too boyish and earnest for that. 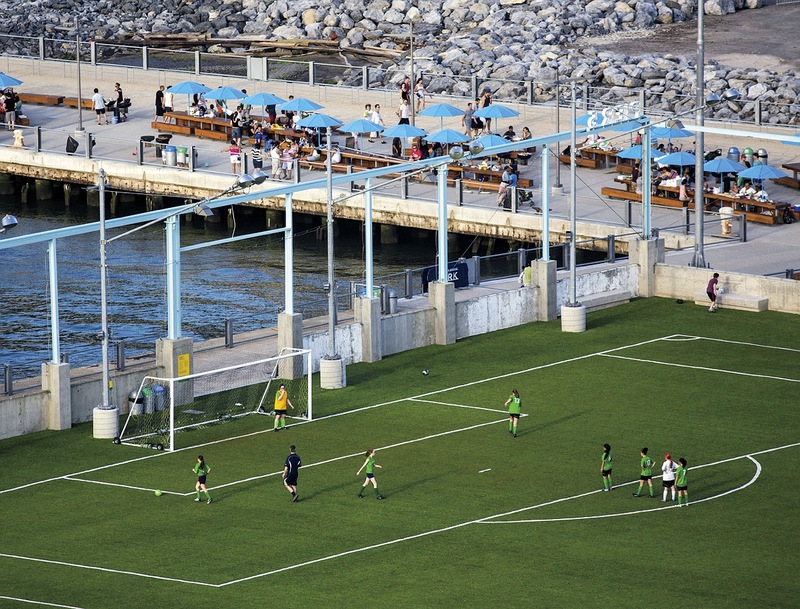 The site is huge, encompassing six abandoned industrial piers in northwest Brooklyn. Most of the 85 acres in this $380-million-plus project have spectacular views of Lower Manhattan, Governors Island, and the Statue of Liberty. Piers One and Six have been open for almost four years; the others will open in stages during the next five years. 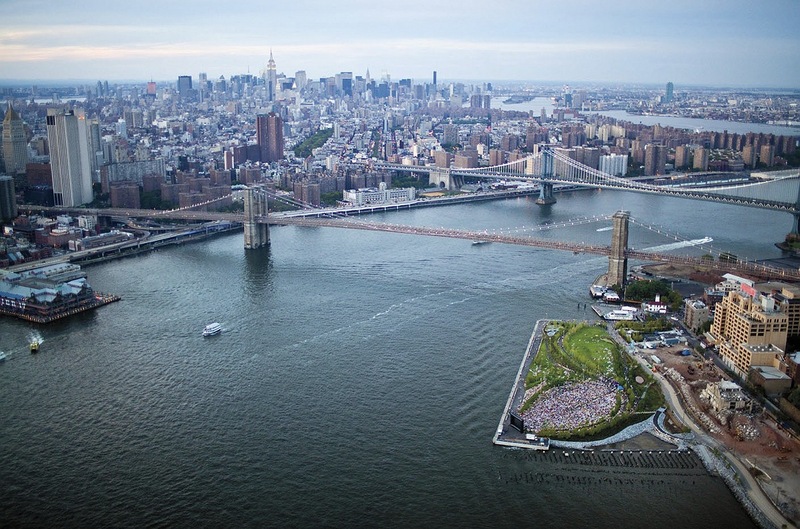 Don’t go to Brooklyn Bridge Park looking for any powerful geometric order like that of the National Mall in Washington, D.C. How the park looks as an overall composition doesn’t matter much to Van Valkenburgh. Its order arises instead from the efforts of its designers to realize the distinctive potentials of its many parts in resistance to “the tyranny of an overriding style,” to use the phrase of principal Matt Urbanski, M.L.A. ’89, of Michael Van Valkenburgh Associates (MVVA). Principal Gullivar Shepard, M.Arch. ’99, amplifies: “The need for one rigorous visual order is compelling in architecture, but landscape architecture is inspired by nature’s diversity and complexity.” Or, in this case, inspired by the (dis)order of cities themselves, where you enjoy not knowing what’s around the next corner. If Van Valkenburgh has an aesthetic here, it is urbanistic: deliberately diverse. Not being shown an overall style in the firm’s design renderings can baffle or upset clients at first: they want a “snackable” image (Van Valkenburgh’s term), not the long process of “tinkering” with endless givens—from wetlands and toxic waste to the pressures of abutters and the surrounding urban fabric—that they later appreciate because of its fecund results. The firm’s product is its process. Its working method is to study each site in great detail and then ask, “What’s the best thing that can be done here to make users’ lives more enriched and pleasurable?” Thus playgrounds, for example, are placed near the two main entrances so parents can easily bring in their kids; and two large lawns are oriented to take advantage of the park’s best views: of the Brooklyn Bridge and of Lower Manhattan. For Van Valkenburgh, the payoff was the inundation of visitors on Pier One’s opening day in 2010. 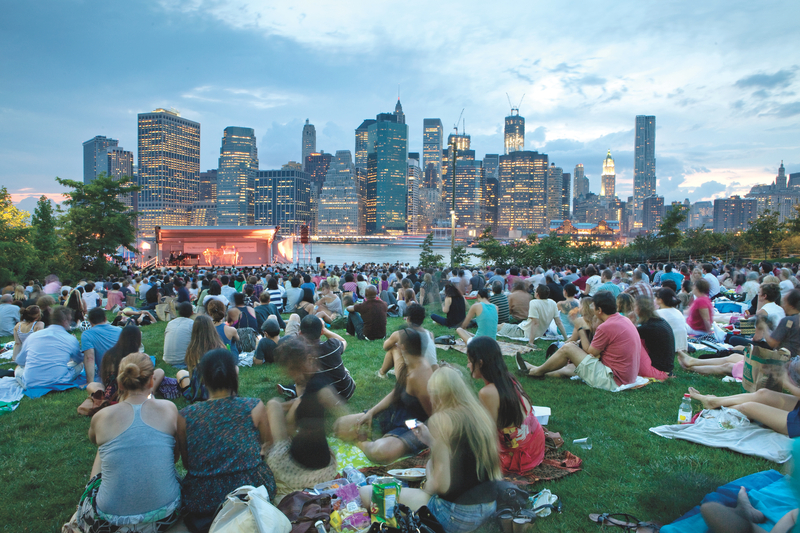 So the Brooklyn park’s already evident pleasures are derived primarily from its dozens of uses, including picnicking, kayaking, people-watching, appreciating nature, playing ball games, and even watching movies on a giant inflatable screen on summer Thursday nights. It is a park of hundreds of carefully designed opportunities for providing pleasure in many forms for people in their many forms. (Which is not to say that each spot isn’t made as attractive as it can be in the quality and look of its materials and construction.) The diversity within each park is striking in the firm’s other work, too. 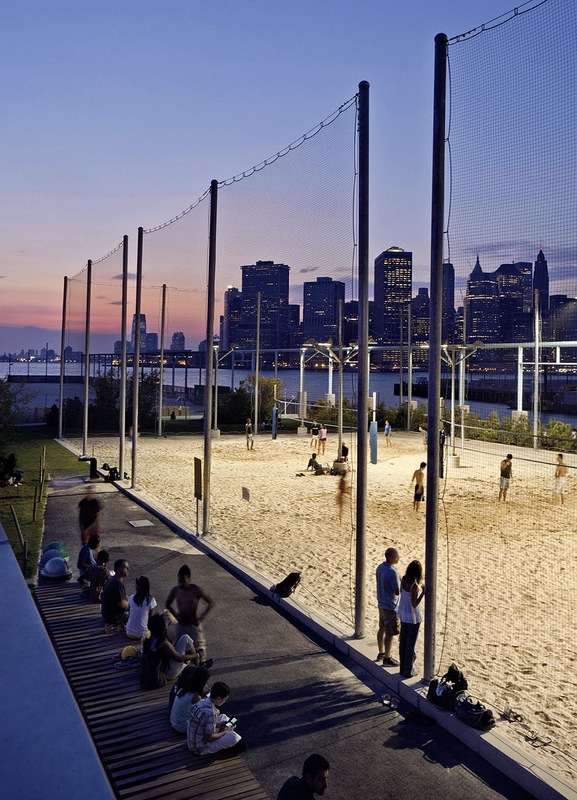 Teardrop Park, occupying 1.8 acres between high-rise apartments in Lower Manhattan’s Battery Park City, is a dramatic example; its 27-foot-high, 168-foot-long stacked bluestone wall sharply divides the park into a complex active play area for children and a peaceful lawn area for adults. The contrast strengthens the character of each part. Serious contemporary landscape architects are also serious environmentalists. Van Valkenburgh’s effort to promote sustainability in Brooklyn primarily entailed reusing whatever could be reclaimed at or near the worksite. This meant not only keeping the piers but also recycling huge amounts of long leaf yellow pine—a superdurable, now unavailable wood—from a demolished building on Pier One for use in benches, tables, cladding, decking, and other furnishings, plus 700 blocks of granite from nearby bridges to make a harbor-viewing amphitheater, and nearly 90,000 cubic yards of fill from Long Island Railroad tunnel excavations to create slopes, mounds, and lawns. 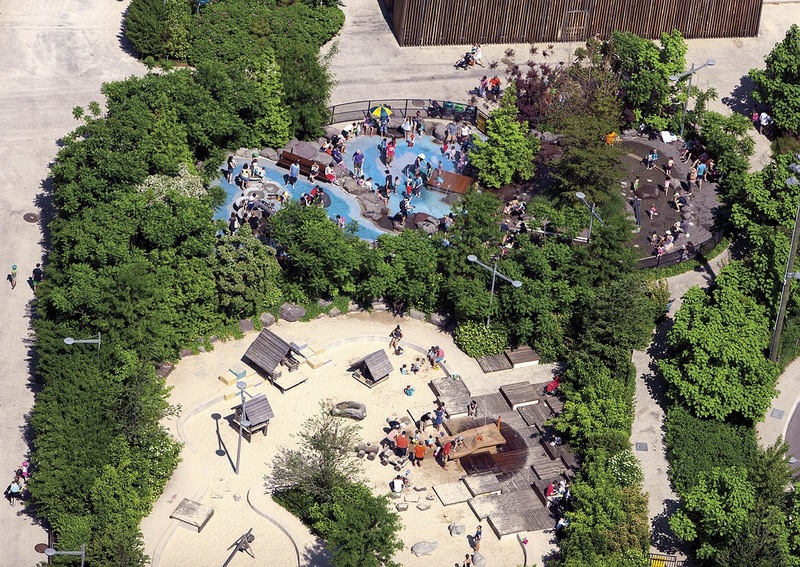 Another kind of sustainability at the park—also pursued by landscape architects these days—is working with nature and no longer trying to master it. 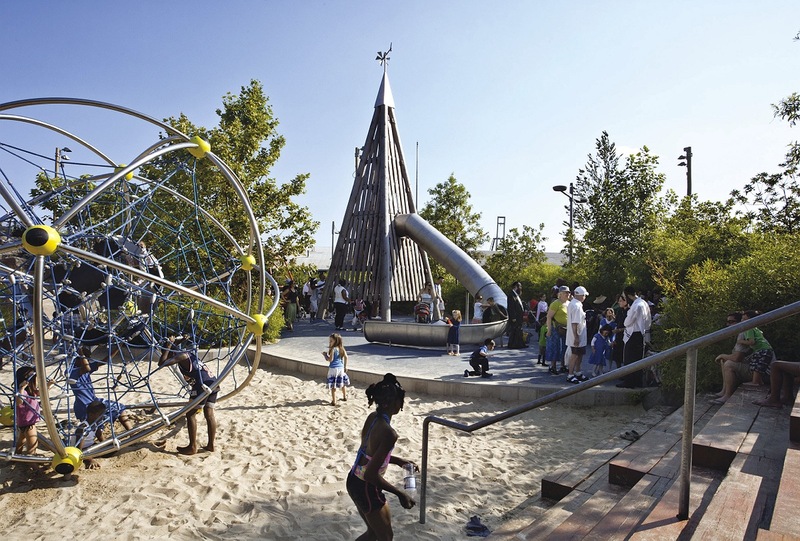 Another kind of sustainability at the park—also pursued by landscape architects these days—is working with nature. They shun the use of pesticides, herbicides, and chemical fertilizers, the channeling of rivers with concrete, and the dumping of storm water into sewers (which wastes water that could be used for onsite irrigation and depletes the water table). 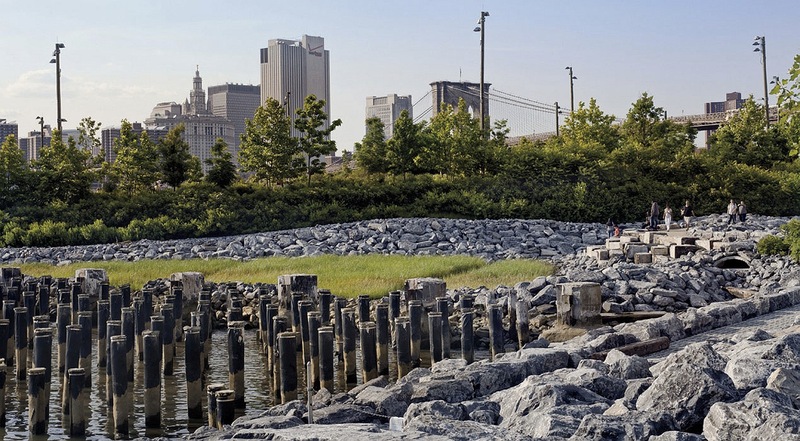 In the Brooklyn park, Van Valkenburgh’s firm makes no futile attempt to wall off the rising tides of climate change: the shoreline is made of loose stones that calm smashing waves, and the root balls of most of the trees are set above the 100-year flood plain. The plant communities installed have been planned to evolve naturally as much as possible, reducing maintenance and thus energy use. Since mid 2009, more people worldwide have been living in urban than in rural areas—a first in human history—and by 2050, that portion is likely to be 70 percent. Urban density is energy-efficient, mitigating climate change: New York has an annual per capita carbon footprint of 1.5 tons, the fourth lowest among the 100 largest American cities (in sprawling Indianapolis, ranked 99, it’s 3.36 tons). In 2008, more than one million city residents worldwide died prematurely because of outdoor air pollution. 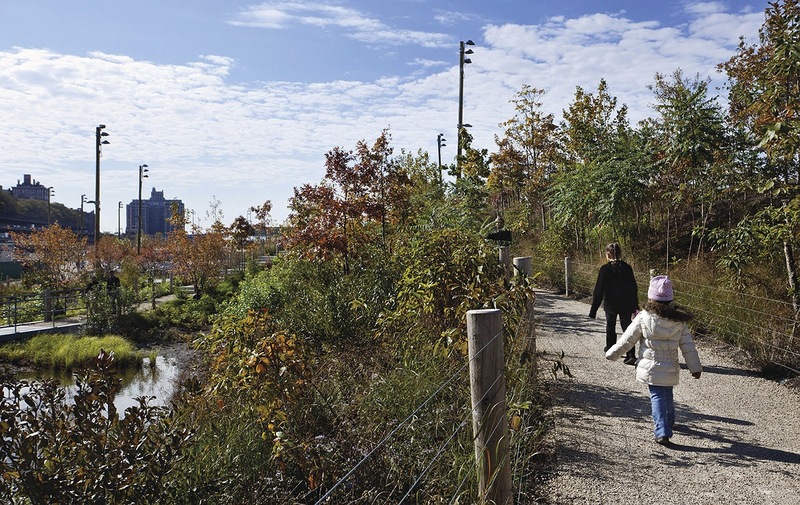 Urban parks, which Frederick Law Olmsted called “the lungs of the city,” offer one way of reducing that pollution: “In 1994, trees in New York City removed an estimated 1,821 metric tons of air pollution at an estimated value to society of $9.5 million,” writes a U.S. Forest Service researcher. Trees lessen summer heat in cities, and, by shading buildings, reduce the need for air-conditioning. All in all, gathering people in dense cities full of green is a way to be more hopeful about the future of the species. 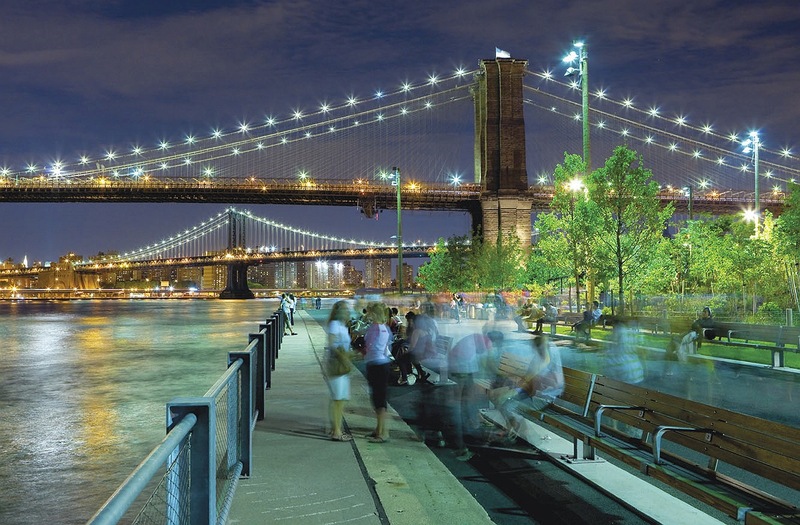 Landscape architects play a crucial role here, and these days, their largest urban projects are along waterfronts. Sustainability again pertains: the world can no longer be so cavalier about protecting its water supply, preventing and remediating its pollution, and managing increasing flooding. 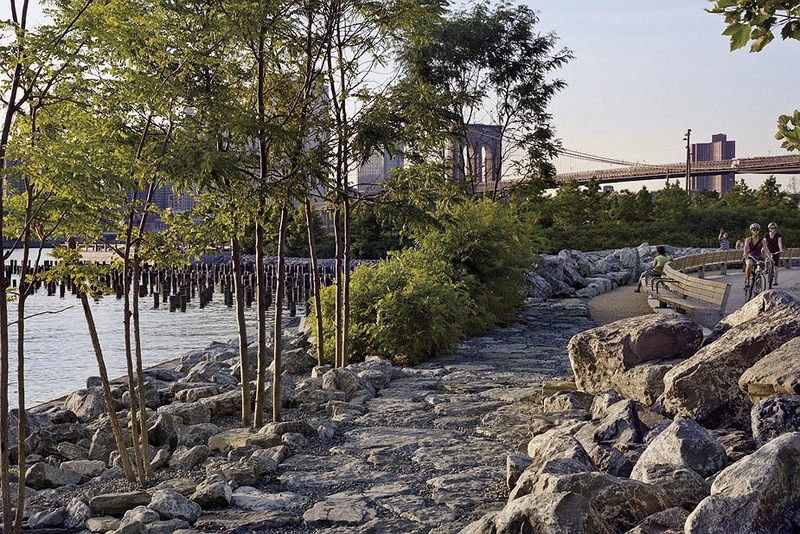 Landscape architects (with hydrological engineers—among the 36 specialist firms involved in the Brooklyn project) are experts at creating ways to do this and to reduce and store storm-water runoff, replenish water tables, and remove pollutants naturally. As the need for professionals capable of addressing environmental problems has burgeoned, so have multidisciplinary design firms focused on the landscape. One of the oldest, Sasaki Associates, founded by GSD alumni in the 1950s, is hired worldwide to do site-planning and -design with a staff of 215. Turenscape, the super-green Beijing landscape architecture (and planning and architecture) firm of GSD design critic Kongjian Yu, D.Des.’95, grew from one to 400 employees between 1998 and 2008 (see “Global Reach,” May-June 2010, page 51). The colossus among such firms is AECOM, a multiservice design and engineering firm of 45,000; its projects include entire new “eco-cities” in China. At the other extreme are smaller landscape firms that focus almost exclusively on the design of beautiful gardens. MVVA is in the middle, celebrated for its design but also respected for its interdisciplinary technical and environmental competence. So how did Van Valkenburgh rise to design eminence in this second age? He has taught at Harvard since 1982, the year he founded his firm, and chaired the design school’s landscape architecture department from 1991 to 1996. In the intervening years, the firm (which now has a staff of 75, in New York and Cambridge) has designed dozens of high-profile landscapes, including the Harvard Yard restoration, Pennsylvania Avenue in front of the White House, the Brooklyn Botanic Garden, and Tulsa Riverfront Park. 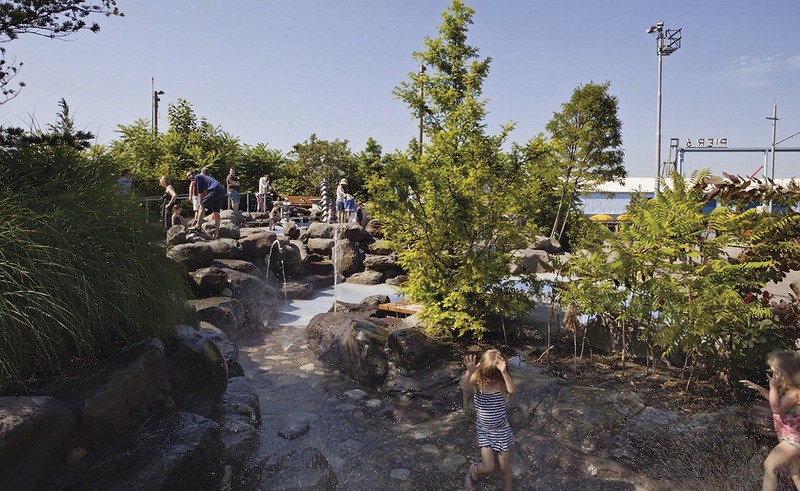 All of the firm’s work—which ranges from small private gardens to 280-acre waterfronts—reflects Van Valkenburgh’s drive to foster rich and delightful daily experiences outdoors. In recognition, he has received the National Design Award in Environmental Design from the Smithsonian Institution’s Cooper-Hewitt National Design Museum and the Brunner Memorial Prize in Architecture from the American Academy of Arts and Letters; he is a fellow of both the American Academy of Arts and Sciences and the American Academy in Rome. Yale University Press published a book on the firm’s work in 2008. The roots of Van Valkenburgh’s design impetus perhaps trace to his boyhood on a dairy farm in the Catskills and his parents’ challenging struggle to make it a success. The middle of five children, the older of whom milked the cows, he was assigned, in fifth grade, the cultivation of the family’s large flower and vegetable garden. At nine, he had an epiphany: “One gorgeous evening my mother dropped me off at the mountaintop pasture where our cows grazed. Cows are stupid. You have to bring them home, which I did every night for over an hour by myself. Up there were rows of sugar maples that we used to make syrup. I turned off to walk among them and was stunned by their beauty. I have been trying to recreate that experience all my life. Entering SUNY Oneonta in 1969, Van Valkenburgh took a class in ecology taught by a soon-to-retire professor who had just read a new book, Design with Nature, by landscape architect Ian McHarg, B.L.A. ’49, M.L.A. ’50, M.C.P. ’51—a passionate screed against the abuses of water, flora, and fauna caused by urban and suburban development, and a recipe for nondestructive land planning. The professor wailed that he had wasted his life by not being one of the landscape architects who were going to save the world. Thus the 18-year-old Van Valkenburgh first heard the name of his calling. In 1970, he transferred to Cornell to pursue a concentration in landscape architecture, where an adviser turned him on to modernist Dan Kiley, then America’s leading landscape architect (who’d studied at the GSD in the mid 1930s), and to Harvard’s Dumbarton Oaks garden and landscape studies institute in Washington, D.C., where Van Valkenburgh first became immersed in garden history and traditions after obtaining a postgraduate fellowship there. He used his fellowship funds to drive across the United States to see Kiley’s works, particularly his “astonishing” South Garden at the Chicago Art Institute, much of which (like the Tuileries and his own family’s sugar maples) resembles a grove—a powerful archetype in landscape architecture. After graduate school, he began working in Boston for landscape architect Carol Johnson, M.L.A. ’57, who had just fired someone for making a plant list that contained 65 spelling errors. “Find them,” she told Van Valkenburgh on his first day. He found 66. She thought he was wrong. They looked it up. He was right. She appointed him, at 27, to be the person who went to tree farms to select the specimens for all the firm’s projects (an activity he still loves—“If I had seven days to live, I’d spend the first at a tree farm”). Colleagues still express astonishment at his vast knowledge of plants. “I can name every plant in the Northeast from a car traveling at 30 miles an hour,” he brags. In 1982, he opened his one-man firm and was hired as an assistant professor to teach plants and design at the GSD. At the time, he was most attracted, among landscape traits, to the sensuousness of densely planted gardens—luckily, because gardens can be created much more quickly than parks, helping him build the portfolio of work necessary for pursuing tenure at Harvard. Van Valkenburgh published three critical/scholarly books during the mid 1980s. Fiercely ambitious—“His ego and his devotion to a mission cannot be separated,” says Riley—he gave himself crash courses in garden history and the newest garden aesthetics and wrote on those in Built Landscapes: Gardens in the Northeast; Transforming the American Garden; and Gertrude Jekyll: A Vision of Garden and Wood. His 1988 “Ice Walls” installation in Radcliffe Yard was a highly original and earnest work. Three 70-foot-long curving wire-mesh walls, fed by irrigation pipes on top, held glistening sheets of ice. How, he seemed to be asking, can landscape design bring pleasure into the coldest days of winter? Van Valkenburgh did get tenure in 1988. As department chair in the early 1990s, he supported diversity of thinking among the faculty, a return to hand drawing, and an appreciation of landscape history. These last two moves were not regressive, as some of his colleagues think, because, unlike architecture, landscape architecture does not thrive on newness. “Its materials and vocabulary—soil, water, plants, paving, seating—are unchanging,” he says, “as are our responding bodies. In a visit to the multibillion-dollar 50-acre Novartis research campus in East Hanover, New Jersey—on which he has worked for more than a decade and where the landscape will take another 45 years to mature—Van Valkenburgh checks out the planting-in-progress of thousands of shrubs and hundreds of trees with his project managers. “This edge is too static. What if we swooped it up to the top of this mound?” he says, marking a long curving line with his shoe. Later that day, in his office near Borough Hall in Brooklyn, as 10 people look at drawings for a competition to revive Waller Creek, which runs through the center of Austin, Texas, Van Valkenburgh is fishing for good new ideas from anyone. He turns to a colleague’s visiting non-designer friend: “What do you think?” She says that it’s not clear how they will design the path along the creek between the four distinctive parks they are stringing along it. Van Valkenburgh says, “You’re right,” and the next day a drawing of a typical path appears. For a “starchitect,” his ego is pretty subdued. Another long-term principal, Laura Solano, head of the firm’s Cambridge office, amplifies this practice of going to anyone anywhere to find the best ideas. She recounts how Van Valkenburgh once sent two employees abroad to study what makes the public streetscapes of seven European cities so successful. He has sent other employees to eastern Europe to learn about research conducted there on the growth, production, qualities, and uses of the American black locust tree (his father told him that its wood “lasts one day longer than stone”). Obsessive enough in the 1980s to have put daily instructions on the desk of every employee at his Cambridge office before any arrived, Van Valkenburgh, say all, has mellowed. He loves spending time with his grandchildren. In his kitchen in Brooklyn Heights (a short walk from Brooklyn Bridge Park), surrounded by hundreds of cookbooks, he makes Irish soda bread for his employees. Every August at his farmhouse on Martha’s Vineyard, he tries not to do office work. Still, no design proposal leaves his firm without his input. William S. Saunders, retired editor of Harvard Design Magazine and editor of four books on landscape architecture, has followed and covered Michael Van Valkenburgh since 1982 . His most recent book is Designed Ecologies: The Landscape Architecture of Kongjian Yu.